I hope you’re well and that the winter has been kind to you, friends. I’m thinking especially of all of you who have been facing crazy weather systems in your neck of the woods this season – hoping you and your families are safe and your homes protected. We’ve had a strange winter at Larch Grove, as have so many others in the northern parts of Alberta. After a summer of rain, rain, and more rain, we went into a winter of very little snow (as of January 21, when I’m writing this, there are four or five inches on the ground), though we saw several weeks of bitterly cold temperatures, -45 to -50 Celsius with and without the wind chill. Those temps are by no means unusual for northern Alberta during the winter, but when coupled with the scant snow, it means increased hardship for all the plants. There’s so little insulating snow to stop cells from freezing. The cold weather hasn’t stopped us on the farm, though. Through the worst weeks in the winter, we’ve been working with a road crew to put in a “floating” road along one far boundary of the land. Come spring, Larch Grove Farm will begin moving to higher ground, and we couldn’t be more excited! If you know us well, you know that Larch Grove is a human-powered, off-grid organic small farm. We’ve built our place from 160 acres of northern bush over the past twelve years, and they have, hands down, been the most amazing twelve years of our life together. We never wanted large equipment on the land, as most of it is untouched northern boreal forest. 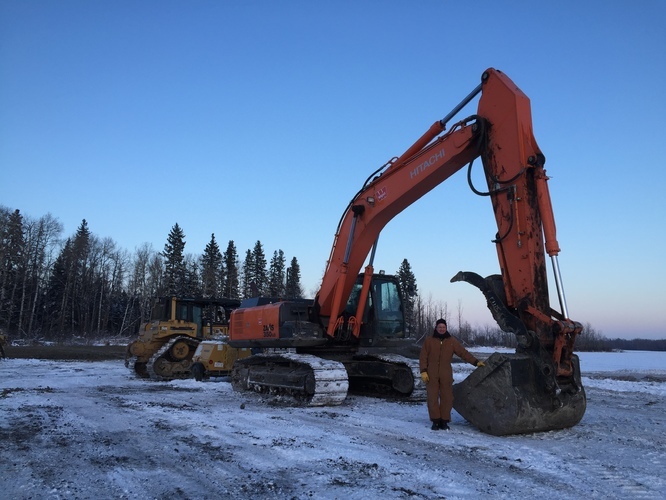 We’ve done our work by hand or with our truck, occasionally renting a small skid steer to help move gravel or put down a pad for our 250-square-foot cabin. But after these past eight years of crazy weather, unpredictable floods, and rainy summers, we’ve made the biggest decision of our lives at Larch Grove: to move our farm. Not to another province or another country; nope, we’re not booking it. We love it here in Alberta. But we ARE moving to the (slightly) higher ground at the other end of the quarter section in the hopes of making our farm more resilient to floods and more responsive to all weather conditions, and putting us in a place where we can apply more of the principles of permaculture that we admire and support. We want Larch Grove to work with the land so that we never take more than we can return to the earth. So, this one time, we’ve broken our own rules and, with the help of a road crew of local guys, we’ve put down a quarter-mile “floating” road over the muskeg at the very northern boundary, up to the hayfield, where there is better light and better drainage against all the unpredictable summers to come. We researched road techniques for two years before taking this step, deciding that we’d need a series of culverts and geotextile to allow the road to be both stable and non-sinking, and to respect the flow of water on the land so that the road doesn’t hamper the flow of water through the muskeg. Thomas is dwarfed by the backhoe! 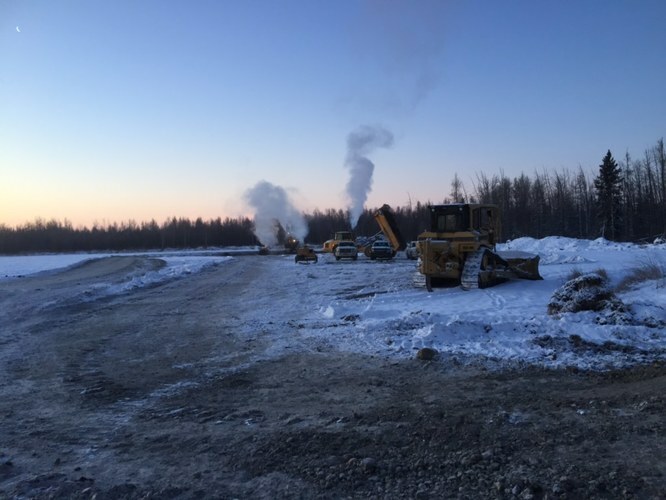 And so, during a week of -45C temperatures this January, the road crew helped us build what will be a lake on the hayfield, using the fill from the hole to build the roadbed and top it off with gravel. They stacked the trees they needed to take down alongside the road in huge piles for us to chainsaw into firewood for our wood cook stove. The final step is to build a gravel pad for our farmhouse, wash house, guest cabin, and quonset out on the hayfield, and then this large-scale work will be complete. The crew works under the rising moon in a cloud of steam. It’s -45C outside. At the same time that we mourn having to bring in large machinery for these tasks (we just couldn’t do it ourselves with the tools we had), we’re celebrating like crazy the freedom this long gravel driveway will give us in our new home on higher ground. Out on the old hayfield, the light is so much better than in the forest verge. Our solar panels will work better and longer, and our home will be filled with natural light. We’re also looking forward to rehabilitating land that has been used for hay cropping and some cash crops over several years, intending to bring it back into organic cultivation for our garden and orchard, and to support the planting of banks of trees and shrubs to enrich the soil and rebuild the forest around the field’s edges. The road has been the first big task! We’ve also been working with our friend Mark, the carpenter who built our tiny cabin, on a bigger farmhouse that will be our permanent home on the land. We’ve been drawing and redrawing the plans for the past three years, and will be preparing the site for the cabin this summer. Do we wish we could build the cabin ourselves? Yep, we sure do. We’d love to have the skill set to build something livable that also looks nice. We can build something livable – we’ve built a bunkhouse already –but not so much lovable, as our house-building skills are limited. Mark has an eye for detail and finishing that makes his structures really lovely. What with working full-time on top of it all as teachers…well, we’re happy to do all the design and research work ourselves, and then to pay Mark to craft the house to our plans. We love that we’re helping the local economy, as well as supporting a small family business we really believe in. So the road has gone in, and the farmhouse is coming along! This summer will be all about moving our small farm, bit by bit, down the road to the hayfield. This past fall, we finally decided to invest in a quonset for our farm tools and truck, and we found a great deal with the company we’d decided on that allowed us to buy the quonset a couple of years earlier than we’d planned. We’ll be building it on the hayfield this spring and creating our new farm around it. Our hope is that, within a calendar year from this August, we’ll have the farm all set up and the gardens ready to transition from the forest verge to the field. It’s been a whirlwind journey, these past few months. In previous years, we’d built the farm up at the pace of what we could afford, trying never to go into debt, trying to save until we could buy what we needed. Now, many years of working full-time jobs (and part-time jobs on top of the full-time jobs) and saving like mad, and some unexpected support from family (thank you, family! <3) have gotten us to the point where we can make the leaps we need in order to get the farm really going. It’s amazing and fulfilling to see all that intensive planning take physical shape…and it’s also stunning how fast it all happens once the ball gets rolling! While the big steps have been in progress, we’ve been making little ones this winter: reading up on permaculture principles to refresh ourselves, talking to friends who know about off-grid life in cold climates, solar systems for small farms, wells, and woodstoves. 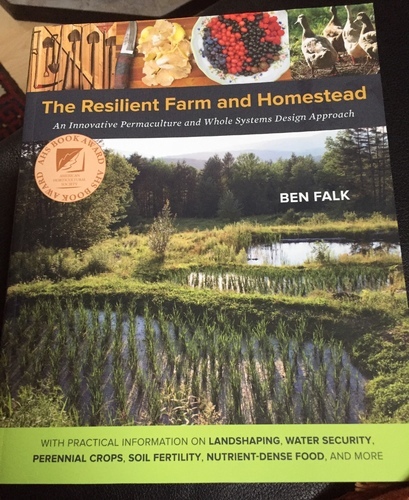 Ben Falk’s book is a great resource for those wanting to implement more permaculture principles around their homes/acreages. We’ve invested in a lovely old ice chest for our farmhouse in lieu of a standard refrigerator, as the power load of a regular fridge would tax our solar array more than we’d like. With our small chest freezer (much less of a power drain) to allow us to freeze jugs of ice, the ice chest will permit us to keep the usual eggs, milk, butter, and vegetables of our simple diet in the kitchen in a clean and efficient way. Plus, we met a wonderful new resource for the homesteading life: the woman we bought the ice chest from, an elderly solo farmer and antiquarian. We connected with her instantly and deeply out at her farm, and we’ll certainly be back to visit and talk with her again. 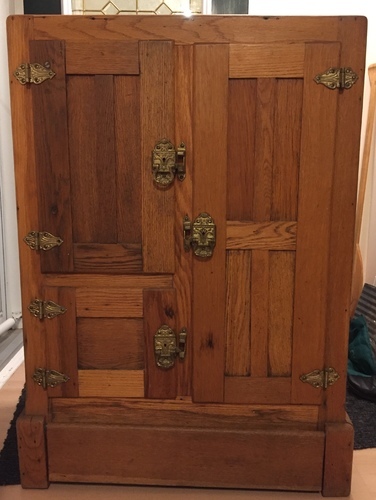 This beautiful old ice chest will soon have pride of place in the farmhouse kitchen. Finally, with Thomas’s support and encouragement, I followed up on a longtime dream and enrolled in a two-and-a half-year comprehensive course in herb-growing and herbal medicine. We truly appreciate the medical system we have in Canada, particularly in Alberta, but we’d also like to be able to grow, wild-harvest, preserve, and use herbs to support our own health and to heal things such as colds, flus, burns, and low energy. I like the idea of using herbal medicine to supplement our existing use of the allopathic medical system. This course will allow me to deepen my knowledge after a lifetime of reading herbal texts, and I’m so excited to think that I will be able to add to the quality of life on our farm in this way. As usual, we balance the positive moves forward on the farm against the backslides, the places where things happen or we make decisions that cause problems. While we’ve been making all of these great moves forward, I’ve learned that I have a medical condition that will prematurely break down my body. In many ways, this was devastating news to receive, but it did have a bright spot: it gave me one cohesive answer to years of seemingly disconnected health issues. Interestingly enough, it was a combination of allopathic and herbal doctors working together who found out what was going on, and that really inspired me to take the herbal medicine course. That felt like a great life choice: to focus on what helped diagnose me instead of everything that has gone wrong in my body. Besides supplementing my diet with healthy food and herbs, cutting down on stress and working with advisors at my job to try and reduce overload, exercising to support premature bone breakdown, and staying focused on the goals I want to achieve with Thomas on the farm and in our life together, I am reaching out to the farm again to manage my health. Larch Grove helped me survive surgery on both my Achilles tendon and my upper abdomen and return to health with few lingering effects, and so I’m looking once again to the daily farm tasks of chopping wood, maintenance of roads, paths, and gardens, summer hauling of water, and building chores to strengthen my body. More than anything else, honestly, just being out under the sky on the farm revives my spirit, and that seems to me like a major part of managing any longterm condition. Dreams, plans, goals, and positive forward momentum in spite of life’s backslides…we’re poised to greet the coming spring with great energy. Posted January 24 2018 in Farm, Garden.